"We decided on a gift basket for a relative who turned 90. 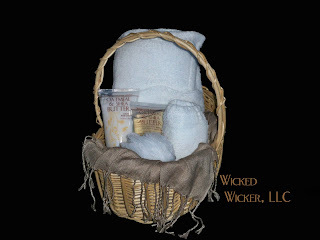 Jill put together a great gift basket with moisturizer, lotion, and tons of other things. She loved this basket and told us she uses lots of lotion! She had flowers all over her bedroom and dining room, so we were very glad we decided on a custom made gift basket just for her. Thanks Jill, keep up the good work." Following from the Blog Hop! Thanks for following me too! I found you on the Queen of Swag hop. I am a new follower from Simple Sunday's Blog Hop. I have followed you can you follow me back? Hi! I'm a new follower both on GFC and Networked blogs. Thanks for joining Good Friends Just Click! I'm GFC following. Hope to see you next week! Great idea!! anyways, how to join GFC? Thanks for participating in my simple sundays blog hop. Already following you on gfc, facebook, and networked blogs. I think baskets filled with lotions ect. are the best presents to receive. It is a gift that is personal and really says that someone thought of you and it lasts for several months. Thanks for stopping by, following back. wonderful basket looking so lovely. Sending basket to neighbor its means you love your neighbor.